We’d love your help. Let us know what’s wrong with this preview of Her Husband's Mistake by Sheila O'Flanagan. Should a woman be ready to forgive and forget to save her marriage? Roxy's not so sure... The riveting new novel from No. 1 bestselling author Sheila O'Flanagan. Perfect for readers of Marian Keyes and Kerry Fisher. R oxy's marriage has always been rock solid. After twenty years, and with two carefree kids, she and Dave are still the perfect couple. Until the day she comes home unexpectedly, and finds Dave in bed with their attractive, single neighbour. Suddenly Roxy isn't sure about anything - her past, the business she's taken over from her dad, or what her family's future might be. She's spent so long caring about everyone else that she's forgotten what she actually wants. But something has changed. And Roxy has a decision to make. Whether it's with Dave, or without him, it's time for Roxy to start living for herself . . .
To ask other readers questions about Her Husband's Mistake, please sign up. Wow what a fantastic book.!!! I couldn’t put it down and could relate to all the wonderful characters. 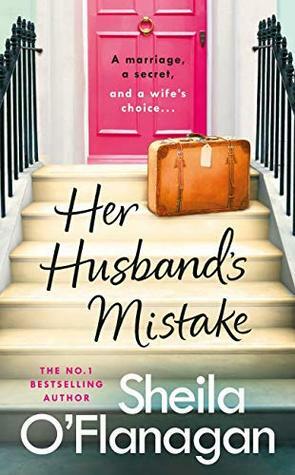 Roxy has been happily married to her childhood sweetheart for 20 years and they have 2 children, but that all changes when she comes home unexpectedly to a life changing discovery. With her life in turmoil Roxy throws herself into her late dads business hoping time will give her more perspective on the way ahead. I felt so much for Roxy and understood how she had changed even though it wasn’t s Wow what a fantastic book.!!! I couldn’t put it down and could relate to all the wonderful characters. I felt so much for Roxy and understood how she had changed even though it wasn’t something she had wanted to happen. The decisions that are inevitable after trust has been broken are unimaginable difficult ! The understanding of Roxys situation was so accurate that it took my breath away. I loved the ending of the book which left me hoping that Roxy will find the happiness she deserves. Brilliant empathetic writing from Sheila O Flanagan , definitely one not to miss!! This is a family relationship driven novel written really well and I felt connected and rooted for the main character, Roxy. When her husband cheats on her with the next-door neighbour, she is left with a big decision. She spends a lot of her time carrying on her late father’s chaueffer business and you witness Roxy take ownership of her life and decisions. I did get a bit bored by this book as its quite long and there’s not as much drama as id of liked! I can always depend on Sheila O’Flanagan to deliver a book that will both entertain me and make me think. I love that while her book’s are light reads, they are not fluff. I find they present issues to debate over in my mind, as I’m always wondering just what I would do if I were in the characters shoes. This book is a constant surprise from the beginning to the end. It kept me in constant tension as it was totally impossible for me to anticipate where the author (or the protagonist/narrator) would want to lead me. This fact kept me reading for two solid days until I finally reached the much liberating end. While it might seem heavy and suffocating (such as the protagonist's life) and hard to bear, the story is in fact so well written that the reader is never bored. Those unexpected twists towar This book is a constant surprise from the beginning to the end. It kept me in constant tension as it was totally impossible for me to anticipate where the author (or the protagonist/narrator) would want to lead me. This fact kept me reading for two solid days until I finally reached the much liberating end. While it might seem heavy and suffocating (such as the protagonist's life) and hard to bear, the story is in fact so well written that the reader is never bored. Those unexpected twists towards the end found me even more eager to reach the end! I have read all of Sheila O'Flanagan's books and she has never failed to disappoint me. Brilliant book, as usual! I had the great pleasure to be able to read this book through NetGalley, before it was published. Many thanks to the author, the publisher and NetGalley. Even if I love this author this story wasn't my cup of tea. I found it slow and it didn't keep my attention. Many thanks to Headline and Netgalley for this ARC, all opinions are mine. I have read a few of Sheila O’Flanagan’s other novels and thoroughly enjoyed them. They look at families and feelings in a humorous and light hearted way and are very entertaining. This one was a real family story. Roxy has recently lost her father and is trying to juggle between her husband and young family and her widowed mother. One day she comes home early from her mother’s house to find her husband Dave and the next door neighbour in their marital bed. Completely shocked, Roxy moves out with t I have read a few of Sheila O’Flanagan’s other novels and thoroughly enjoyed them. They look at families and feelings in a humorous and light hearted way and are very entertaining. Completely shocked, Roxy moves out with the children and stays with her widowed mother to work out what she should do. She had started running her father’s chauffeur business when he was taken I’ll and now she continues as she loves meeting the clients, providing a great service and she truly enjoys the driving. However she obsesses about Dave and cannot rid herself of the image of him in bed with the neighbour. She feels hurt but he manages to turn his own indiscretion on her, saying he felt neglected whils she was helping her mother. Roxy is a strong female character and I really enjoyed her humorous,self deprecating voice. I was rooting for her right from the beginning. She seemed very real and her struggles will resonate with many women. Dave, however, became more and more controlling as the book progressed. He can’t see he has made a mistake and projects it all onto Roxy. She shouldn’t have stayed with her Mum so much, he felt neglected that’s why he transgressed. He hates her success in the chauffeur business and wants her to stop. In fact in some ways his character was almost too over the top. Would any man really behave like this nowadays? Roxy has to decide what to do about his” mistake”. Can she forgive and forget or does the hurt run to deep? I liked hearing about Roxy’s clients, particularly the mysterious Ivo, whom she starts to have feelings for as the story progresses. An enjoyable read, perfect for the beach or holiday! If you’ve read other books by this author you will certainly enjoy this one. I absolutely love Shelia O'Flanagan and I was very excited to get a copy of this book from Netgalley. I was not disappointed. Basically Roxy and Dave are rock solid until she catches him with the next door neighbour in a comprising position. What will she do ? she has to make a decision. Roxy is not sure about anything now - her past, her Dads business which she has taken over or what it will mean for the family. She has spent so long thinking about everyone else she has forgotten what she wants I absolutely love Shelia O'Flanagan and I was very excited to get a copy of this book from Netgalley. Sheila O'Flanagan is one of my favourite authors and I was really looking forward to reading this new novel from her. I was very surprised when I began reading as the book is written in the first person. Maybe it's just me but I am not at all used to this style from this author so it took me aback somewhat and I wondered whether I would in fact enjoy the book. I didn't need to worry as I really did enjoy it - the tale of a woman in business was a real inspiration for me. I felt that I wanted to gi Sheila O'Flanagan is one of my favourite authors and I was really looking forward to reading this new novel from her. I didn't need to worry as I really did enjoy it - the tale of a woman in business was a real inspiration for me. I felt that I wanted to give her husband a good kick though! I was so pleased that the issues around gender equality were, I felt, handled well and the book was all I have come to expect from this author. As you can see, a Dubliner all my life. My parents owned a grocery shop in the Iveagh Markets, in the Liberties area of the city and I guess city blood runs through my veins. As a child I enjoyed reading and telling stories and everyone thought that I end up in a job which had something to do with books and literature. But though I applied for a job in the library all of the job offers I got were i As you can see, a Dubliner all my life. My parents owned a grocery shop in the Iveagh Markets, in the Liberties area of the city and I guess city blood runs through my veins. As a child I enjoyed reading and telling stories and everyone thought that I end up in a job which had something to do with books and literature. But though I applied for a job in the library all of the job offers I got were in commerce. I turned down lots of them before my mother accepted one for me (I was on holiday at the time). It was in the Central Bank of Ireland and that’s how my career in financial services began. I started out in administration and then moved jobs until finally I was working as a dealer in a commercial bank. Eventually I was promoted to Chief Dealer (the first female CD in the country). I traded lots of different things – foreign exchange, swaps, options, bondsâ€¦all of the kind of things you read about in the papers and that sound very technical and difficult. Of course once you’re doing it, it’s not half as technical as it sounds. But I still loved reading and writing (which I did in my spare time) and I desperately wanted to write my own book. I guess I never quite got over the fact that I was never offered the library job! In my thirties I decided that it was now or never and I sat down, stuck Chapter 1 on a page, and started. I wrote the whole thing before sending it off. I was offered a publishing deal (with no advance) by an Irish company but only if I wrote a different book! So back to the drawing board, I started again. It was another two years before it was published. It wasn’t until I’d written a few books and was offered a contract (this time with an advance!) from another publisher that I felt able to give up my trading job and write full time. So, even though it took a long time, I eventually realised my dream of being a full-time writer. And now I also write a business column for the Irish Times. I don’t write for any particular audience but I suppose I must have people like me in mind – people who have busy lives and who like to escape into someone else’s for a while.